It seems that’s what Russia is doing- taking delight in the cluelessness of our “national” broadcaster. This seems to me the classic bully pose, saying, “who, me? I didn’t do nuffink”, with a little of the “yes, we can” Russian imperial spirit thrown in. But actually the above is just an aside :-). The main problem here is that although Fawkes reports this Russian handover, the BBC fail to report the Russian prisoner taking. While 15 are handed over, 20 prisoners were taken in the Georgian port of Poti. In addition the Russians confiscated US-made Humvees. Actually this is no joking matter- if one day (gd forbid) we need to take on Russia in a serious conflict, we can be sure the “peace” brigade will have been banking away every “good deed” of [bad, mad] Vlad as a way of painting us the unreasonable parties. As you can see, Russia is still losing the propaganda war. The image is from the BBC website. It’s not so much an illustration for this page as evidenceof the BBC’s playing along with the Russian message. I wish it weren’t here- or there. Meanwhile I noticed something from the BBC’s linked article interestingly titled “In control and on the move”. Sounds dynamic, huh? It was where the writer of the article says “In the past few days, up to six Georgian navy vessels have either been crippled or sunk. Wait a second there. 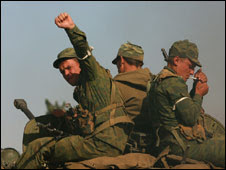 The only Russian action that had any international support was the action in Ossetia. I am not sure of their “peacekeeping” mandate, but why is it not the focus of the article that the Russians are operating as a rogue state in Georgia? Richard Galpin only points out that the Russians are acting outside their zone at the very end of the article. The BBC keep reporting Russian agreements to this or that positive, constructive move. Nothing happens on the ground except that the Russians continue to extend their “mission”. Meanwhile the BBC can only say that they are “in control” and “neutralising the threat”. What threat would that be when the actions of Georgian troops, which some believe necessitated the Russian intervention, took place in South Ossetia, not Abkhazia? And furthermore what “threat” when the Russians have been destroying naval vessels outside the sphere of any possible action? And furthermore what “threat” when, as has been proven, the “in control” Russians are overwhelmingly militarily superior to their Georgian counterparts? This article has to be one of the most despicable attempts by a BBC journalist to whitewash evil and extinguish the truth. I wish I could say “just kidding”. This is the regime whose secret service according to the Economist “was good at harassing journalists trying to find out the truth” about Beslan. This is the regime whose “Kremlin-choreographed message”, according to Garry Kasparov , “presents Russia as surrounded by enemies on all sides, near and far, and the military intervention in Georgia as essential to protect the lives and interests of Russians”. Mmm- so unsuccessful. No-one bought that line, did they? This is the regime headed by a former KGB agent who has doubled and tripled his secret service operatives’ salaries, re-making it among the most sought-after professions in Russia. Now of course I would accept Reynolds as having some point to make, if he offered credible evidence instead of assertion. But a man who omits mention of a word of the Russian secret service in this entire article! Can you recall “psy-ops” in Iraq? Pretty much every kind of public relations tool was scrutinised as such. Now- crickets chirruping once more as the caravan moves on. So who do you think the observers encountered in Ossetia? They’d surely never be singled out for special operative attention, would they? Oh, and should Paul Reynolds need any more educating, and should he care at all, about Putin’s knowledge and expertise in media matters, he might try reading this. “a BBC broadcast yesterday portrayed tiny, poorhouse Georgia as a propaganda powerhouse and Russia as an information victim – an illustration of the Russian propaganda machine’s effectiveness”. So much of the information the BBC have been giving out had to have come from the Russian authorities. They have an information machine for the purpose. What have the Georgians got? An English-speaking President, and that’s about all. So trust first (when it comes to Russia). Verify later- apparently to the BBC. I realise there have been many people who think the reverse, but I am also mindful that Russia really has worked out an information strategy par excellence, especially on the web. I found this a very interesting insight from a rather offbeat source. WHAT’S AN INVASION BETWEEN FRIENDS? As has been pointed out, Russia has just invaded Georgia with 150 tanks rolling across the border. Sky has it as the lead story – the BBC has the Olympic opening ceremony as its lead story. World class broadcasting, eh? If you want news, best avoid the Olympic broadcaster. Clearly given the HUGE investment that the BBC has made with OUR money, viewers are going to have the Olympics shoved down their throat, like it or not, invasions or otherwise.